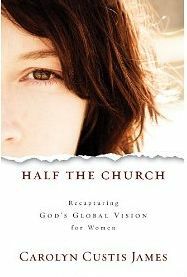 In Half The Church, Carolyn Custis James makes a case for why the plight of women around the world should be an issue of concern to Christians. I commend the author for drawing attention to the way in which women are treated appallingly in many parts of the world simply because they are female. Some of the stories included in the book are quite shocking. The harm suffered by many women is an important thing for Christians to be aware of and act against. The reminder that the primary issues Christian women in other parts of the world grapple with aren’t necessarily the same ones we debate in the west is also a valuable one. The biblical exposition in the book primarily comes from the first few chapters of Genesis and from Ruth. I thought what she had to say on Genesis was interesting however at times it seemed like she may have been reading a bit too much into her interpretation of Ruth. It would have been nice to see other important sections of scripture about womanhood dealt with in more detail. For me where the book went wrong was trying to extend the discussion to deal with gender roles. While the case for protecting women from exploitation, poverty and abuse is crystal clear, what an approach to gender roles that respects women and honours God would look like is not. Bible believing Christians who are seeking to create healthy environments for women often disagree. The discussion in this book was quite unclear and didn’t really add anything to the debate. The underdone discussion on gender roles somewhat distracted from some of the other important arguments in the book. I really liked James’s book When Life And Beliefs Collide and had high hopes for this book. While this book has some worthwhile things to say, I don’t think it was as good.